Home / Entertainment News, Gossip and Drama / This is witchcraft! See what happened during a crusade in Ukambani, Hii ni kazi ya shetani (VIDEO). This is witchcraft! See what happened during a crusade in Ukambani, Hii ni kazi ya shetani (VIDEO). 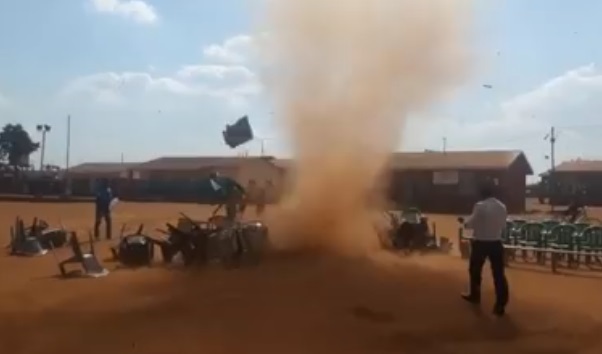 Wednesday, August 1, 2018 - There was shock and drama in Ukambani during a crusade after a huge whirlwind started blowing everything on sight in the air. Those who had gathered at the crusade watched in shock as the wind blew chairs and speakers in the air while others scampered for safety. The shocking scene was caught on camera and some people are linking the bizarre incident with witchcraft.